Weddings are beautiful events filled with joy, family… and LOVE! That’s why we recommend saying, “I do,” to a dream spa honeymoon. Check out these five tips to plan your perfect getaway. However, don’t assume spa vacations only mean robes, cucumbers on your eyes, and massage. Just as weddings have changed and matured, so have spa vacations. If anything, today, it is spa plus as resorts couple relaxation and revitalization with just about any activity, whether it’s surfing, safari, or, even, circus tricks. Meaning just like there’s someone for everyone, there’s a spa honeymoon for every couple. Couples are more likely to live together before getting married, which means they are probably have dishes, home appliances, and linens. Creating a spa honeymoon fund allows guests to contribute dollar amounts towards your dream getaway, taking the stress out of paying for a vacation. Plus, spas and spa resorts often offer all-inclusive packages. This means you won’t have to stress about extra expenses, and you can focus on what’s important – each other. Not all couples are the same, and not all spas and resorts are the same. First, sit down together and decide what want from your spa vacation. (It will be more fun than figuring out that seating chart!) Keep in mind the size of the spa and what specialties it offers. You may prefer an adventure spa filled with exciting outdoor activities or a classic resort with gorgeous grounds and endless luxurious treatments. Plus think about where you would like to spa, as there are fantastic options on all corners of this earth. 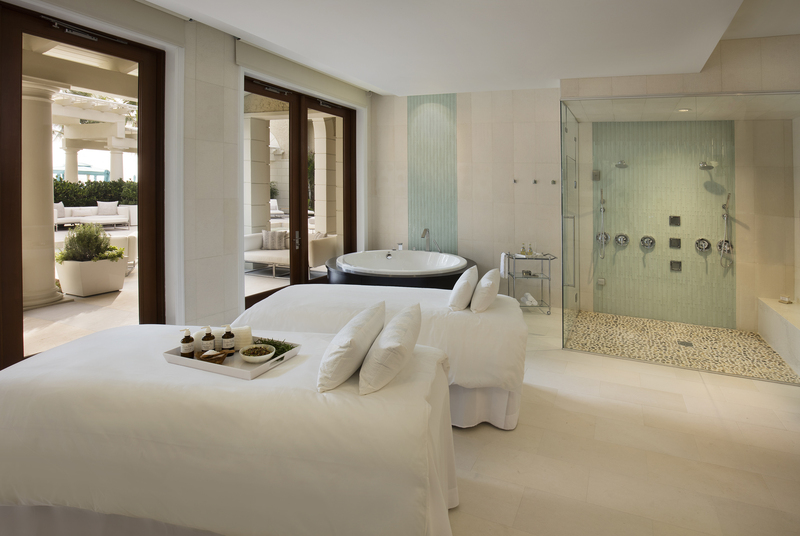 Click here to find ideas for your dream spa honeymoon. The honeymoon is often a couple’s first chance to relax and enjoy scrumptious meals together –often after weeks of dieting! When you plan your honeymoon, think about food options. Today, most spas have stepped up their cuisine game, and many feature celebrity chefs that create delicious and healthy menus. Some locations even have Michelin Star restaurants on their properties. Spas offer more than just a couple’s massage for love birds that aren’t ready to be apart. Check out the spa’s offering of hydrotherapy or water treatments, as they are great options for duo dips. These experiences can include soaks in mineral baths, cold plunges, underwater massages, water circuits, hot tubs and more. Water treatments encourage circulation through the use of hot and cold contrasts. (Although we can think of a few other ways to get the blood boiling). In addition, water treatment rooms are often co-ed so it’s the perfect way to practice your inner otter and float side-by-side holding hands with your mate. Spafinder specializes in helping people find their ideal spa and wellness getaways and experiences. Visit Spafinder.com to find profiles of top locations like The Breakers Palm Beach, exclusive travel deals, and featured locations. We also post blogs on exciting destinations like Top Spas in Spain. Now if you could only get your great aunt to RSVP, your wedding would be perfect! Send a Spafinder Gift Card, the perfect gift for every occasion. Sign up for access to exclusive deals and insider tips.